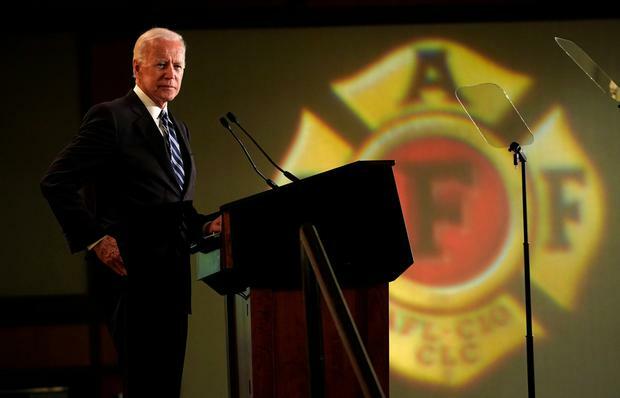 Speaking at a firefighters’ conference, former US vice president Joe Biden didn’t leave much doubt he’ll be running for president. “I appreciate the energy you showed when I got up here. Save it a little longer, I may need it in a few weeks,” he said after a raucous welcome. He added: “Be careful what you wish for.” His appearance reminds us of why he could be formidable Democrat contender. First, if Senator Bernie Sanders wants to fundamentally change the United States (“Socialism!” Republicans will scream) and Senator Elizabeth Warren says the system is so rigged that incremental changes won’t work, Biden appeals to Americans’ better angels, to the idea President Donald Trump doesn’t understand what makes America great. “That’s not who we are,”Biden says after describing the divisiveness and anger Trump amplifies. “We’re better than that,” he cajoles the crowd. It’s a solid message for a candidate running in a fairly good economy with a president who’s stressing out the country. Second, there are few politicians as adept at making a traditional economic message against stereotypical fat-cat Republicans. “I look around this room, I see the people who built this nation,” he told the crowd. And, boy, have Republicans given him material to work with. He told the firefighters: “Did you see the budget that was just introduced? It cuts $845bn (€747bn) . . . in Medicare and . . . $240bn (€212bn) in Medicaid. Why? Because of a tax cut for the super-wealthy that created a deficit of $1.9trn (€1.68trn) and now they’ve got to make somebody pay for it.” Bingo. Any presidential candidate who isn’t saying some variation of that every day is foolish. This is where you remind voters that Trump ran as a populist – better health care, middle-class tax relief, protect Medicare, get better trade deals – but governs as an oligarch: take away Obamacare, increase the gap between rich and everyone else with tax cuts for him and his pals, slash Medicare and get us into trade wars. Three, Biden’s speech is suitable for all audiences become he talks about core values. (“America is an idea, an idea that goes back to our founding.”) It’s “corny” he says – and then recites the opening of the Declaration of Independence. If Sanders, Warren and others are narrowcasting to a segment of the party, Biden is quite consciously talking to the party as a whole and implicitly promising to unify two wings of the party.